Lowdown: Same Pride & Prejudice story taking place in an alternative universe. There’s a first time for everything I do. For example, Pride and Prejudice and Zombies is the first ever Jane Austen book I get to read. Sure, it deviates somewhat from Austen’s original vision, but all events taking place are carbon copies of the original only they're set in a zombie infested England. The carbon copying is done with such passion that most quotes are very close if not identical to the original (a fact I can attest to having watched the recent Pride and Prejudice film, the recent Bollywood version, as well as the 1995 TV mini series several times). The second personal first with Pride and Prejudice and Zombies was it being the first book length graphic novel I got to read. Sure, I’ve read comics here and there, but never a full length effort; I have sort of imagined that honor would go down to Watchmen, but as it turned out an unlikely candidate has pipped it to the post. Precedents aside, I think it’s worth mentioning I first learned about Pride and Prejudice and Zombies through John Scalzi’s blog, Whatever. The important lesson there is that blog exposure does count when it comes to spreading memes; in my case all it took was the photo of a Victorian attired zombie on the book’s cover to convince me this book might be a good, refreshing idea. It was. Plot wise, Pride and Prejudice and Zombies is an exact copy of the Jane Austen original. The differences are to do with Austen’s England being in a situation where the gates of hell have been closed, forcing the dead to become zombies. Zombiness is contagious, so the people of England have to protect themselves; those that can afford it go to Japan (to study the way of the samurai? ), while those that can afford it less – like the Bennet family – go to China to study martial arts. Our hero, Elizabeth, is one such grand master whom no zombie can bother (they can, however, get her dress dirty); yet she has a point to prove to the better connected, mainly that Chinese training can be potentially better than Japanese. It’s the devotion that counts. You get the point: Pride and Prejudice and Zombies is a rather silly take on Jane Austen’s original. Silly is perhaps the wrong word; satiric would be a better way of referring to it. Between Austen’s built in criticism of the class system and its culture, this new incarnation adds a lot of references to Victorians’ hidden sexuality, to point at just one contemporary improvement. It becomes clear as you read through the book: through zombie references added to this new version, we are able to laugh at all the silly elements of Victorian society that Austen criticizes and which, to our modern eyes, appear silly. It works, but the silliness does grow upon itself and quickly enough it becomes a bit too silly as you get the point and the zombies become more of an interruption to Austen's original story. Lucky for Pride and Prejudice and Zombies, Austen's original story is so good that you can easily focus on it and regard the zombies as some sort of contemporary silliness. The pleasure to be had out of reading Pride and Prejudice and Zombies is very well aided by the graphic novel format. 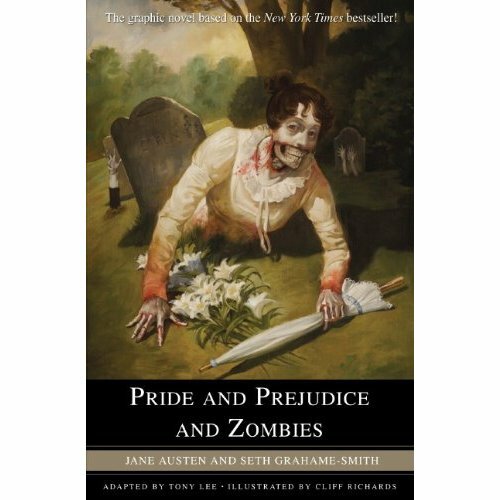 This ensures that the zombie idea does not get too tedious, since it's a much faster and flowing a read than a conventional book (and for the record, Pride and Prejudice and Zombies is also sold as an ordinary paperback in addition to the comics version). Additional help is supplied by the graphics, which I have found to be exceedingly good. Granted, I am not experienced in the art of the graphic novel to venture an opinion on how good the drawings are compared to others' work; yet I can confidently say I've enjoyed it greatly. Overall: Original, flowing and great fun at 4 out of 5 stars. Most of all, it made me really want to get to know the original better; I've already watched the mini series again, and I'm seriously considering reading Austen's original. Heaven forbid!